Place 1/4 cup chocolate chips in a freezer ziplock bag and immerse in hot water until chips are melted. Snip the tip of the ziplock bag and squeeze eyes, nose and mouth onto a marshmallow. Scoop ice-cream onto plates, two scoops per plate, arranged on top of each other. Place chocolate chips on for buttons and set marshmallow head on top. 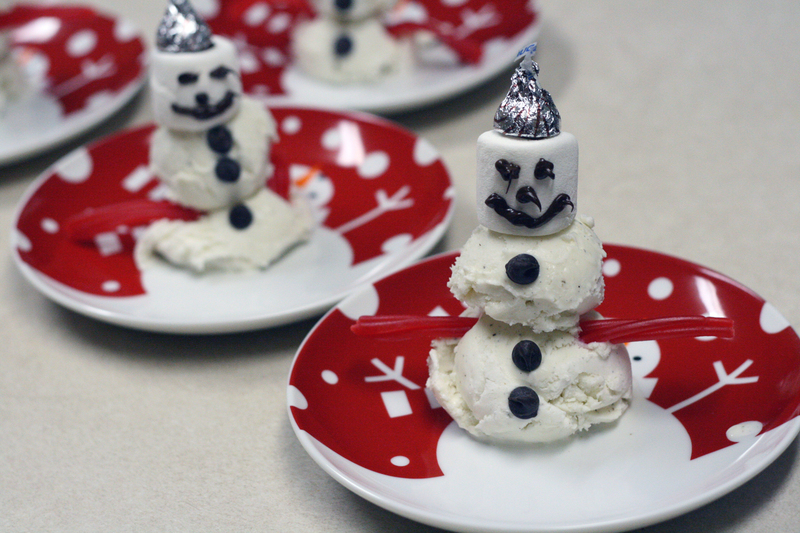 "Glue" cherry or chocolate kiss to marshmallow with more of the melted chocolate chips. Haha, I've never seen that done before! What a fun idea!